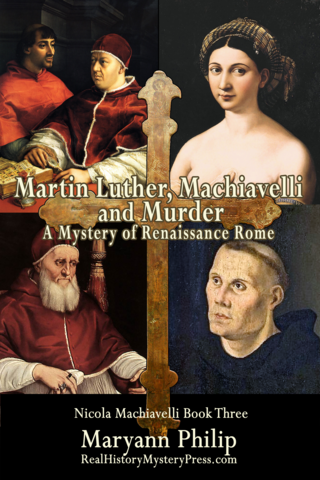 The corruption and grandeur of Renaissance Rome during young Martin Luther's real-life visit form the backdrop to this tale of murder and papal politics. Forced to work with the licentious artist Raphael and winsome Nicola Machiavelli to solve the murders, Luther battles temptation while witnessing abuses key to shaping his future destiny. The real-life sagas of the infamous Borgia family and Leonardo da Vinci form the backdrop to this mystery, set in the opulence of Renaissance Rome and Milan. Niccolò Machiavelli's illegitimate daughter and bewitching ex-mistress solve three murders with help from Leonardo and Lucrezia Borgia—including that of Lucrezia's actual half-sister. 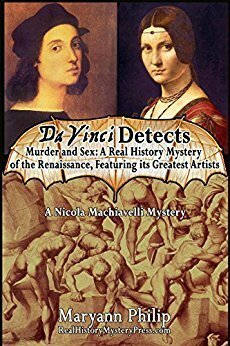 Leonardo da Vinci uncovers a serial killer while working for the infamous Niccolò Machiavelli on a secret project for Florence. A feared figure from Leonardo's past also seeks his help, forcing da Vinci to re-live the nightmare of his public arrest after being anonymously accused of homosexuality in his youth.